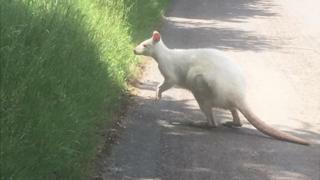 A rare albino wallaby has been spotted bounding along a road in the Wiltshire countryside. The Australian marsupial was spotted "leaping along" Stock Lane near Marlborough on Saturday morning. Valerie Hood, who photographed the animal, said: "A white thing was moving along the roadside and we thought: 'That doesn't look like a sheep'." Albino wallabies are extremely rare and can change hands for hundreds of pounds. Ms Hood said she was travelling out of Aldbourne towards Axford when she saw the "tiny kangaroo" on Stock Lane. "We drew up and it started leaping along and then it stopped and looked at us," she said. "It crossed the road in front of us, looked around at us and went off into the bushes. "It seemed so whacky but it was definitely a white wallaby. "I've asked around to try and find out and was told that somebody in the area of Axford or Ramsbury breeds them but I haven't been able to find out anything more." Wiltshire Police said it has had no reports of wallaby-related incidents. In 2014 an escaped wallaby was caught by officers in a garden in Marlborough. It was thought it escaped from a nearby farm.